One day, driving for some hundreds Km and for many hours, I let my mind going around the vast fields of knowledge and it came back with an interesting demonstration of a well known mathematical formula. 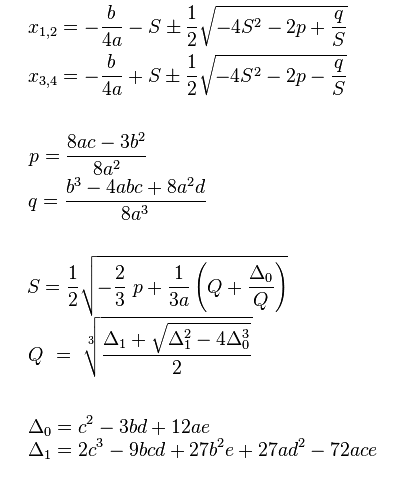 As you know the explicit formulas to solve the equations of any degree becomes immediately complex with the increasing of the equations degree and, more than that, it is possible to provide an explicit formula only for equations of 2°, 3° and 4° degree. This thing, and the difficulty of “deriving” them, have been creating in me some un-comfort since my days in high school. The formula of 2° degree is already very complex and I’m sure 99% of you does not even remember it. I remember that the demonstration was based on adding and subtracting quantities that magically allowed to simplify and aggregate the equation in a way that can be solved. I never liked this procedure since I found it very artificial. So I had this little thing in the back of my mind for years and years. and I was thinking a way to use this knowledge and build something out of it to get to the generalized solution. And indeed I found a nice way to do so and do not get crazy with the strange demonstration that is given at school. Interesting… The resolution formula is amazingly similar to the general one, there should be something good in it! I was amazed to see that it was possible to revert the equations! and the second is to solve a I degree equation. if the resulting system that links a,b,c,d,e with α,β,γ,δ,λ can be solved, the resulting formulas should be derived. The resulting formula should look like as a composition of a double II solving formula with one “nested” in the other as the equation in α,β,γ,δ,λ is a II degree equation nested in another II degree equation. I know, mathematics will cry that I’m crazy in saying so…. This suggest to me that the procedure wont’ work further, as clearly stated by a well known theorem that says that there are not explicit solving formulas for equation of an higher degree that IV.